Atanua is a real-time logic simulator designed for educational use. Atanua has an intuitive, OpenGL accelerated user interface, with which the user can place components and wires. Components include all common logic blocks, including gates, latches and flipflops, about 30 different 74-series chips, an 8051 microcontroller variant, various LEDs, buttons and 7-seg displays. ...... inputs as well as buttons that are bound to the user's keyboard. LEDs in various colors as well as 7-segment displays are also included. 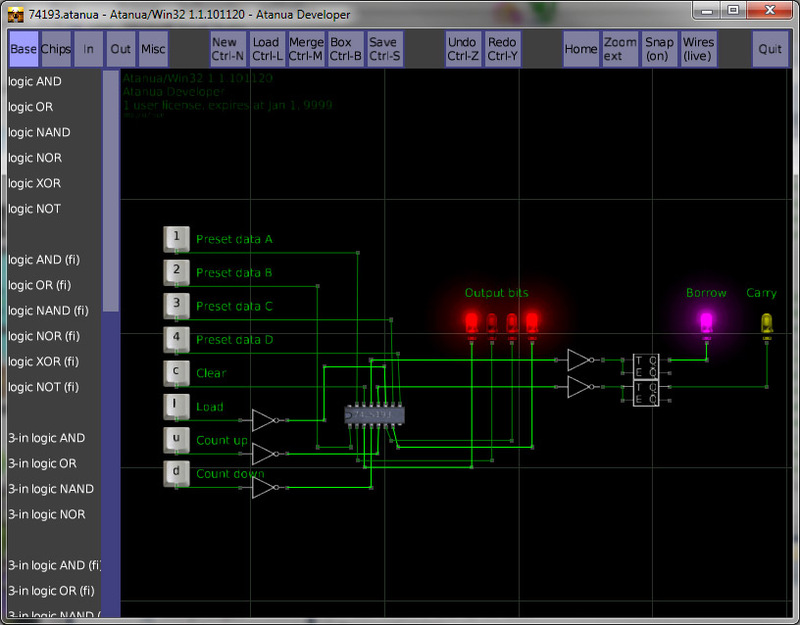 There is also a simple logic probe for debugging. The simulated parts are designed to resemble their real-world counterparts, which is more attractive for the students than pure schematics. The students can practice lab experiments using the simulated chips. The simulation shows the signal state of each wire in real time. In addition to high and low signal level, parts may output "invalid" signal, stating that there is a problem with the circuit, such as outputs connected together, or missing wirings from some chip. Additional parts can be made using the plug-in interface. As an example plug-in, a driver for the Velleman K8055 USB experiment board is provided, with which the user can mix simulated and real-world components. An anti-cheating tool is also available for teachers who wish to use Atanua for homework. Qweas is providing links to Atanua 1.2.110613 as a courtesy, and makes no representations regarding Atanua or any other applications or any information related thereto. Any questions, complaints or claims regarding this application Atanua 1.2.110613 must be directed to the appropriate software vendor. You may click the publisher link of Atanua on the top of this page to get more details about the vendor.